On Thursday February 22 a group of approximately 25 residents came together at Project 107 to discuss the ambitions they have for creating a resilient and sustainable community in Waterloo. 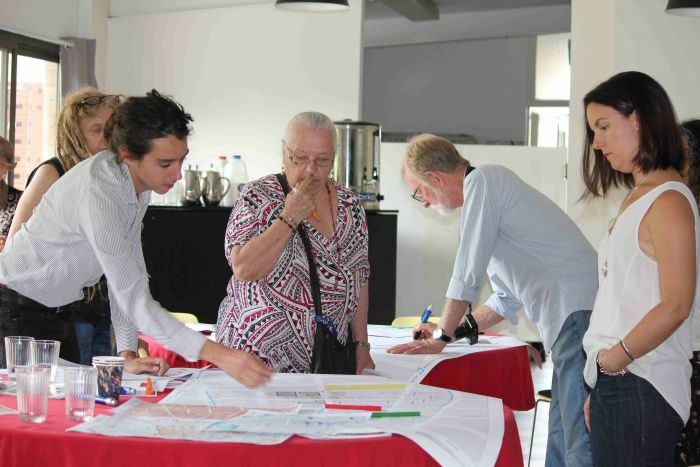 This design-led workshop was organised by the Inner Sydney Voice as part of the Community Capacity Building project. In three steps people worked in groups to identify the most applicable interventions for their daily environment as part of Waterloo redevelopment. After everyone had individually chosen their desired level of sustainability for each of the six themes (water, energy, traffic, waste, nature and food), the real negotiations started in four groups. Where someone in your group might want to ban cars from the street, you might yourself think a separate bike lane will do. The lively conversation in each group resembled the importance of these choices and reflected the trade-offs of every proposition. After the groups agreed which measures should be taken to raise the sustainability level they had to design these measures on a map of their environment, so the concrete measures became visible. On the maps many of the chosen measures appeared. All of them suggested a functioning public space, where people could walk, sit down, and linger. At the same time more space was claimed for green space, water and food supply. “We can introduce water squares connected in a promenade that connects the new station deeply into the neighbourhood.” These water squares are in use as a playground, market square or even parking on dry days, but when it starts raining the square fills up with water, stores it for a while and releases it to the creek system after the rain has gone. This way the square prevents the streets from flooding, as the water is temporarily kept out of the street system. “We can plant trees in every street to create canopy cover.” Not only should every existing tree be preserved, as they already provide lots of shade, but as the urban heat island effect will increase in the future more shade is required. The urban heat island effect occurs when large amounts of concrete and pavement exaggerate temperatures on a hot day. “Why don’t we plan for community gardens, urban farms and food roofs?” Lots of people living in the area love gardening and have a rich tradition and understanding of how food can be grown in the city. However, the spaces to do this are scarce. One or two urban farms, supported by community gardens spread along streets and corridors and food roofs on top of buildings, could provide most of the daily food for the people living in the area. Urban farms and food roofs can incorporate aquaponics – a closed system of constantly recycled water in which fish are grown. The fish provide nutrients to the vegetables that are grown in a hydroponic system (without soil, but based on water). In this system the vegetables take up the nutrients hence clean the water before it is recycled back to the fish tanks. This system is able to produce much more food per hectare than agricultural land. A major constraint for the workshop was the lack of a future street plan of the area, but the group generally concluded that it was very beneficial to prevent cars as much as possible from entering the area, with the exception of emergency services and the many other services that are delivered to social housing tenants in their homes. Centrally concentrated parking at the entrances of the neighbourhood and at short walking distances from the homes could be a solution to make that happen. Different options for the Waterloo redevelopment will be presented by government to the community in the coming months. This interactive workshop collected the first ideas and viewpoints from the residents about how to respond to those options. This planning process is ongoing and invites people to come forward and discuss whether these proposals fit their ambitions for the future of the area.